Utility to export Safari RSS feeds as an OPML file. This enabled you to import your list of feeds into other news aggregators. 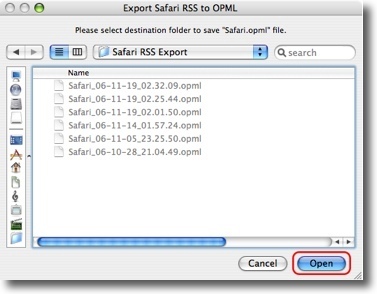 Safari2OPML - Export Safari RSS to OPML file. You can import Safari RSS feed into news aggregator like Vienna. By the moment also empty folders are exported, this is a know issue that will be solved next release. please report your experience to keep this table update. Browse to destination folder where to save Safari_date.opml file. Check your path and press Save & Quit button. A file named "Safari_YY-MM-DD_HH.MM.SS.opml" is created. Open your preferred News aggregator and import your Safari.opml file. Safari2OPML script source code page. Based on King-on Yeung script. Based on Sameer D'Costa script. Thanks to Sameer D'Costa, King-On Yeung and Steve Palmer for their support. Safari2OPML is packaged using the Platypus script.